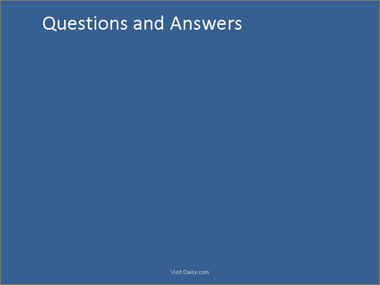 Use professional voice talent, i.e. 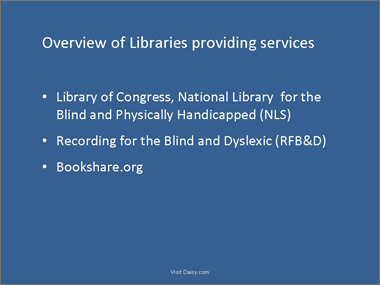 narrators. Have been digitally mastering for several years. 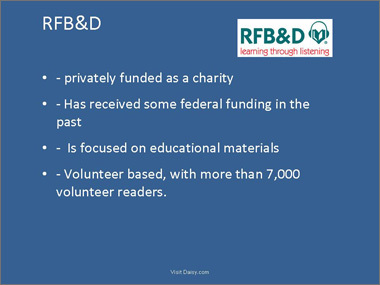 Volunteer based, with more than 7,000 volunteer readers. Have converted some titles from analog cassette. 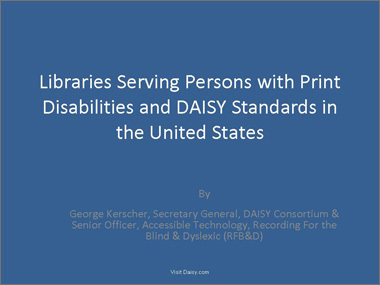 Recently awarded a five year Federal grant, approximately 6.5 million US dollars per year. 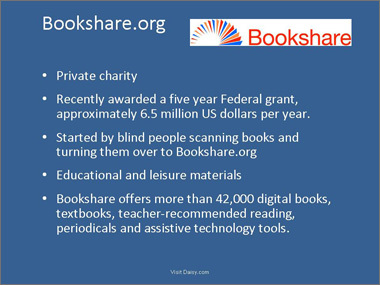 Bookshare offers more than 42,000 digital books, textbooks, teacher-recommended reading, periodicals and assistive technology tools. 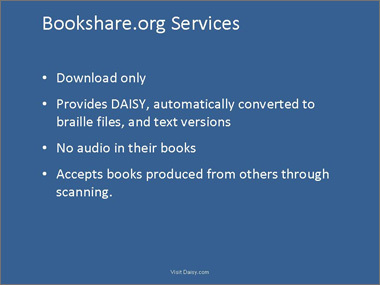 Accepts books produced from others through scanning. 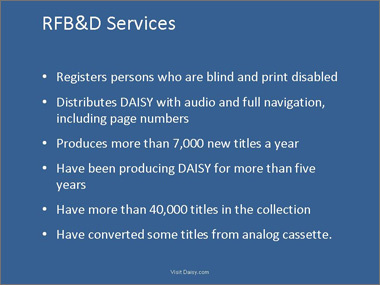 Also 60% of books produced by RFB&D are for higher education, but this is a small portion of what is needed. 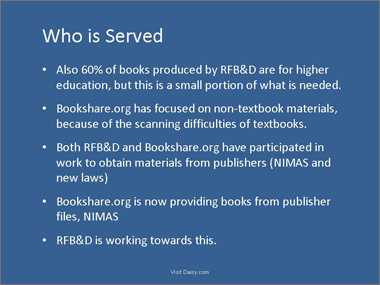 Bookshare.org has focused on non-textbook materials, because of the scanning difficulties of textbooks. 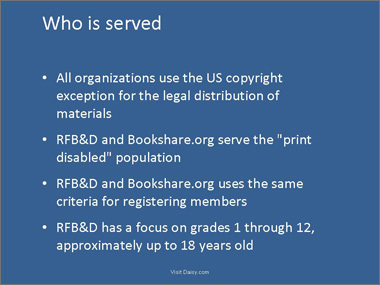 RFB&D is working towards this. 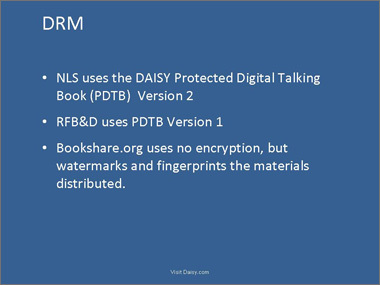 Bookshare.org uses no encryption, but watermarks and fingerprints the materials distributed. 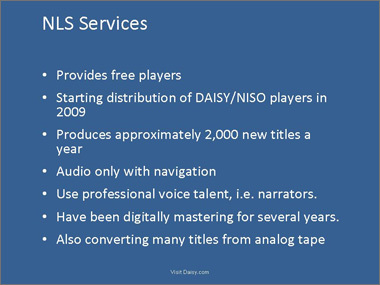 NLS will distributed an expected 500,000 players in the coming years. 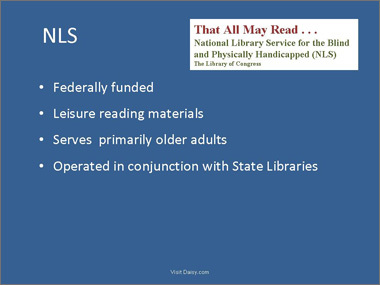 XML format (NIMAS) in the next years.